With pubs being such a major part of British culture, it wasn't long until someone decided we needed an excuse to spend even longer in them - hence the creation of the Gastropub. When David Eyre and Mike Belben took over The Eagle in London, they combined pub culture with British dining and introduced this delicious concept. 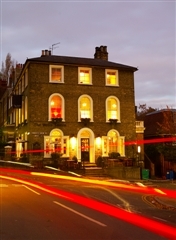 Many soon followed and here LondonTown.com lists the best gastropubs in London. The Harwood Arms has upped its gastro offering, moving away from being just another West London pub and blossoming into a place where fine food flourishes. The critics seem to agree and the Harwood has steadily built up a collection of awards and accolades, including the first and only London pub to be awarded a Michelin star. From the people who own the highly rated Pot Kiln in Frilsham, the food is along the same best of British lines, think great game and wild produce, much of which is sourced from the nearby Berkshire countryside. Resolutely down to earth, they get the basics just right. Their signature dish, to give an example, is a venison Scotch egg, to be enjoyed as a bar snack, and they serve the best potatoes in London - crushed and fried to perfection. Sunday is a celebration of all things delicious and British, try choosing between grilled haunch and sausage of Berkshire roe deer with parsnip hash and field mushrooms or the rib of red ruby beef with smoked bone marrow and Yorkshire puds. If you haven't exploded with satisfaction by this point then you must try a bowl of warm baked custard with Yorkshire rhubarb and gingernut biscuits. The Thomas Cubitt - named after the great Belgravia architect - is a perfect paneled pub, enclosed by French windows on two sides which open out on to the pretty Elizabeth Street and the huddles of tables outside, adding to the light, airy feel. The menu is focused on unfussy British country house cuisine. Crisp crackling, slow-cooked Sunday roasts, fresh seafood, chocolate sponge, and lots of seasonal game and cheeses are the mainstays. The dining room prices are eye-watering (not surprisingly given the location, and the stunning building), but the short bar menu is excellent value, and it packs out at weekends. If you like this sort of thing you're in luck, the owners also run The Alfred Tennyson, The Orange (their first pub with rooms), and The Grazing Goat which are unique but all have the same Cubitt House feel with light, airy dining rooms and decent gastropub menus. This modern Belgravia pub fits in with its well-heeled neighbourhood. The Pantechnicon on Motcomb Street was given a new lease of life in 2017 with a major refurb and a new branding, reopening as The Alfred Tennyson. Part of the Cubitt House group, which is also responsible for The Orange and The Thomas Cubitt, the modern Belgravia pub is spread across four floors and has a quintessentially British feel, fitting in with its well-heeled neighbourhood with a chic decor and a local pub meets fine dining atmosphere. The inviting ground floor pub, which brings together wood panelling and pink and green hues, offers casual eating and drinking while on the first floor it's more sophisticated with sleek service and an indulgent yet refined menu. The main menu is short but sweet with pub classics such as fish and chips sitting alongside more contemporary options like beef croquettes and green peppercorn mayonnaise (a real highlight) while the daily changing specials board, which puts a focus on sustainable and seasonal produce, offers further tempting options like middle white pork scotch egg served with apricot chutney. 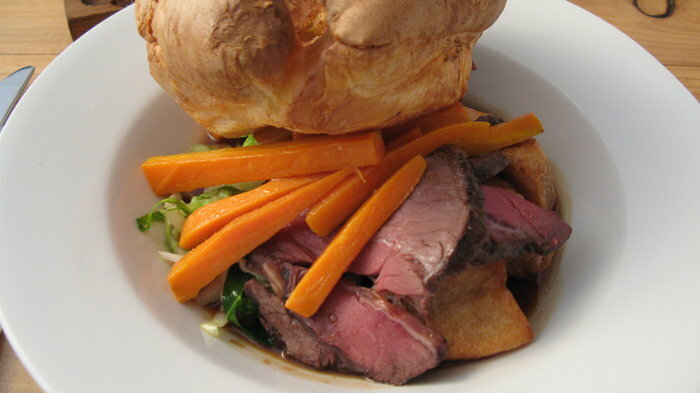 The Sunday roasts are not to be missed, with the roast venison an exciting alternative to the standard options, and the puddings are real crowd pleasers with favourites such as baked cheesecake and apple pie. The third and fourth floors are home to a private dining room and a cosy 35-seat Loft Bar, which is also available to hire. From the outset, when Nico Treguer, Gareth Roberts and Bash Redford began restoring The Culpeper pub in June 2014, they created a rooftop kitchen garden and installed growing beds were they grew their own vegetables, salad leaves and herbs for the kitchen. But in June 2015 the third phase of their restoration reveals the next step: the rooftop greenhouse, and bar where guests can enjoy signature cocktails, and food cooked on a bespoke grill designed by Mark Parr of the London Log Company. A simple menu serving cuts of meat from Ginger Pig butchers and salads from the garden is available throughout the day for lunch and dinner, while the greenhouse offers protection from the elements all year round. The rest of the Victorian pub has an industrial yet rustic feel and the food - "solid and dependable", according to Jay Rayner - changes depending on what's available. Diners can expect dishes such as grilled pork chop with chargrilled vegetables and mustard potatoes; beef, mushroom and new potato broth with a blue cheese salad; and roast vegetable, Israeli cous cous and hazelnut salad with mint yoghurt. Oh how we wish we lived in Bermondsey, then we could call this gem of a pub our local. We'd stop in for a regular drink at least once a week and treat ourselves to a slap up meal every month. Similarly to the Riding House Café – the West end brasserie from the same team - it's the kind of place that we'd like to claim as a second home with a convivial atmosphere, plenty of drinks variety and great food - though the prices would prevent us from making this a daily ritual.They even have their own cinema in the basement, available to book for private parties, which is even better than our previous favourite place to go to the movies, the Electric cinema in Notting Hill. With eateries like this, along with nearby Village East, The Bermondsey Kitchen, Delfina Studio Cafe, and not forgetting The Hide Bar... oh how we wish we lived in Bermondsey. The Orange on Pimlico Road is a pub with rooms that does both rather well. The mid-19th century building has been lovingly restored by the team behind The Thomas Cubitt and The Alfred Tennyson with four en-suite bedrooms above the gastropub, each with a king size bed, marble en-suite, air conditioning, iPod dock and free Wi-Fi. In the pub on the ground floor wood fire pizzas with interesting toppings (like fig, prosciutto, gorgonzola and walnut pesto, and prawn, red pepper, chilli and capers) are served along with dishes like Devon lamb rump and roast turkey which can be washed down with real ales, fine wines or cool cocktails. Children can have a small wood fired margherita and home made ice cream or choose from many of the main dishes at half the price for smaller portions. Food is carefully sourced, partly from the nearby Pimlico Road Farmers' Market which takes place every Saturday. This pioneering organic pub has done a good job of going gastro without losing the atmosphere of a proper boozer. In part, this is due to the quantity of tables and chairs they've crammed into the stripped pine main bar, forcing people to share and creating a buzzy, convivial atmosphere that works well whether you're on a birthday party or a date. It's also due to an excellent range of organic micro-brewery beers, which keeps the CAMRA types happy, even though the decor's a bit lighter and airier than they might like. The short menu - pies, roasts, whole fish, stews, and a veggie option or two - seems pricy for such simple food, but you're paying for superb ingredients, and with it being the only gastropub in the UK to be certified by the Soil Association, everything on the menu is guaranteed to be organic. It's not hard to see why the Islington locals keep coming back for more. The award-winning Yummy Pub Co has expanded further with the transformation of The Victoria in Mile End into a trendy gastropub. Formerly a typical east London boozer with a bland façade and chabby chic interior, the pub has now been given a new lease of life and is a welcome addition for locals. 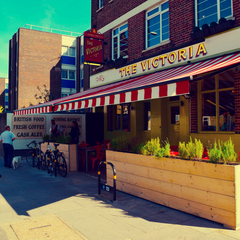 Following the same format as the company's King's Cross venue, the Somerstown Coffee House, The Victoria now boasts three distinctive themes across its three floors. On the ground floor guests are welcomed into a stylish gastropub that serves a range of beers, cask ales and food, including a tempting range of British tapas dishes such as scotch eggs and breaded brie. This floor is also home to a newly created artisan coffee bar, open early every day and accessible from both inside and out. Venturing onto the first floor, diners will find the Ssshh Supper Club, a trio of themed rooms including The Kitchen Room, where you can watch the chefs at work; The Board Room, ideal for parties and small gatherings with its hidden stash of aged and oaked scotch; and the Lodge Room, a kiddie free area that's perfect for a quiet Sunday Lunch or romantic date. Meanwhile, the basement houses the hidden Magri's Cocktail Bar - the entrance to which we are keeping firmly under wraps! On top of all that, the generous sized beer garden is home to a cocktail caravan and ingenious sheltered booths to ensure the garden is inviting all year round. This huge gastropub is another ambitious project courtesy of the people behind Cubitt House (Stefan Turnbull and Barry Hirst, the guys behind The Thomas Cubitt, The Orange, and The Alfred Tennyson) who have been brought in by the Portman Estate who also own the nearby Portman Bistro and the Vinoteca wine bar, to re-hash what used to be the Bricklayers Arms in New Quebec Street. An expensive refurbishment has transformed The Grazing Goat into what appears to be a large country house, set in the Marble Arch end of Marylebone. Inside, you'll find a strong English theme, regarding both the interiors and the menu. Simple British food is the fare of choice here with fish and chips, steaks and Sunday roasts all found alongside more modern dishes, such as the chilli salt squid on the starter menu. And for those that can't bear to tear themselves away after a hefty meal, there are eight boutique hotel rooms upstairs, with six standard rooms and two suites. Take an elegant, Georgian building on a side street in Hampstead - a sauntering five minutes walk away from the heath - add a chilled-out pub area complete with low tables, sinking sofas, real ales on tap, board-games and a simple, but top-notch, bar menu on the ground floor, and an intimate series of three dining rooms on the first floor serving an award-winning menu, and you've got the ingredients for a classic gastropub. Named after the famous mineral spa that first drew crowds to Hampstead's hallowed ground, The Wells Tavern in Hampstead is - like its namesake - continuing to attract those in need to refreshment and rejuvenation. The main draw is the food, which blends classics (calves liver, sausages and mash, lamb shank) with more modern European dishes (chorizo, feta cheese and chicory, squid and wild mushroom risotto) using fresh, seasonal produce. This place is prime Sunday Lunch territory - fill up on a traditional roast, washed down with a pint of ale or a glass of wine from the true connoisseurs wine list, then head to the heath for an invigorating walk; on which dogs can most certainly attend as they will be full of energy after feasting on the special dog treats provided on the menu. Keats and Constable, both former residents of the street (No 1 and No 40 respectively), would surely approve. The Holly Bush is the quintessential London pub. Built in 1643 it has changed little over the centuries. Hidden in the attractive back alleys of Hampstead, The Holly Bush is a cosy warren of small rooms with low ceilings giving it a distinct homely feel. With a rich gastropub menu including traditional dishes - beef & ale pie, pheasant and fisherman's pie are among the favourites - combined with a roaring coal fire in winter and a spot out the front to enjoy a refreshing Pimm's in the summer, this is the ideal place to while away a weekend afternoon. Real ales such as Fuller's ESB, London Pride and Harvey's Sussex Best make it more than worth the climb up the steep steps - just be careful on the way back down after a tipple or two. With its own microbrewery in the basement and good by-the-glass wine list this would be a good boozer by anybody's standards. But couple this with the simple, honest cooking using quality ingredients and you have a gastro pub that stands out from the over-priced restaurants in this affluent area. As a restaurant alone, it is the best thing in Hampstead; especially recommended is their Sunday lunch. The honest approach is evident before you even glance at the menu as the fuss-free interior, plain wood furniture and bare brick walls attest to the no frills attitude of owner Jasper Cuppaidge. When you've tried the Red Poll beef, seared scallops or their baked fig, goat's cheese and walnut salad you'll understand why it gets so busy. And, like the punters filling up the place, you'll be back. When Russell Norman, famed for Polpo, Spuntino and Mishkin's, and as The Restaurant Man on BBC2, opened his first pub in November 2013 it seemed a change in direction. But in August 2014 the connection with his hugely successful Venetian restaurants in London became more apparent when Ape and Bird became Polpo at Ape and Bird. The three floor pub is a restaurant, spritz bar and dive bar housed in an old Victorian pub on Shaftesbury Avenue. As well as a minor revamp, the name change brought in a new menu with a pizza section which makes good use of the on-site pizza oven. Brothers Ed and Tom Martin, the duo behind well-loved London eateries The Gun, The Botanist and The Empress of India, opened their tenth London pub, The Jugged Hare, in Chiswell Street, a stone's throw from their Chiswell Street Dining Rooms. Situated next to the Barbican Centre, the pub forms part of the famous old Grade II listed building and former home of the Whitbread Brewery from 1750. Featuring a 'theatre' kitchen with an eight-spit rotisserie and a charcoal grill, the pub lives up to its name with a menu of spit-roast meats, seasonal British game, wild fish and shellfish on offer on a daily basis. Expect to see whole suckling piglets, spit-roast free range chickens and numerous cuts of steak on the menu. Puddings are indulgent pub favourites, with sticky toffee pudding, chocolate and salted caramel brownie, and strawberries and cream typical options. They also promise that four British cask ales will always be available on draught, including their own Jugged Hare pale ale. From cheap budget accommodation to luxury 5 star hotels see our deals for hotels, including Park Plaza London Waterloo from 52% off.